Far from the crowds that flock to southern Peru, you can get your “Indiana Jones” on in the northern territories where ancient Incan and Pre-Incan archaeological wonders rival the famed citadel of Machu Picchu. The mountains surrounding Chachapoyas in northern Peru contain the lush vegetation of the Andean cloud forests offering uncrowded conditions and unlimited adventure for the intrepid traveler. Chachapoyas (‘Chacha’ to the locals) is a quiet, colonial town with an attractive main plaza, a number of interesting churches and balconied 19th-century buildings. There are modern accommodations ranging from first-class hotels to backpacker style hostels like the Chachapoyas Backpackers, a reasonably priced hostel offering private rooms with a full-bath or dorm rooms with shared a bathroom. The Inca road system was the most advanced and longest transportation system in pre-Hispanic South America, spanning almost 25,000 miles. It began in today’s Santiago, Chile and traversed north through the Andean mountains of Peru all the way to what is now the country of Colombia. Amazingly, remnants of this road are still present in the Chacha area. This section of the Inca Road has fantastic vistas, unexcavated ruins and narrow slot sections cut into the hills by the ancient builders. To trek, a section of the Inca Road, hail a taxi to the hamlet of Levanto and look for the faded orange sign that reads Camino Pre-Hispanico. It will be an all-day hike back to Chacha, but well worth the effort. Pro tip: You may need to ask the locals for help spotting the sign and beginning the trek. Try this phrase, “Estoy buscando el camino Pre Hispanico. ¿Sabes donde está?” (basically saying I’m looking for the Inca road). Locals are normally delighted to help a gringo. On my visit, three small children walked me to the spot where the “road” begins. This hike is for experienced trekkers only as it’s challenging to find and follow the road in some areas. Part of the time I was lost and a bit disoriented, although much of the time I was in total wonderment at the still intact record of the ancient Incan people’s remarkable accomplishment. Alternatively, you can save yourself some frustration and hire a guide in Chacha. Be sure to take plenty of water, wear comfortable hiking shoes, and bring a picnic lunch. The small village of Cuispes is not well known by the world and it would be easy to overlook this place were it not for several spectacular waterfalls in the surrounding cloud forest. 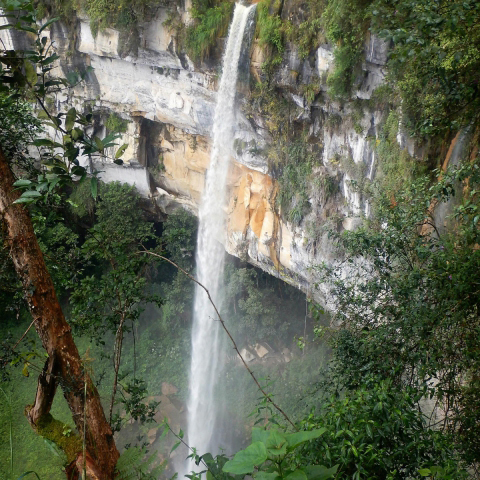 Most notable, Yumbilla Falls drops 2,938 feet, making it the fifth tallest waterfall in the world. This is a new discovery; it was officially measured by National Geographic in 2007. One of the best parts of a visit here is there are very few tourists; you will have the tranquility of this hike to yourself! I highly recommend staying at the scenic La Posada de Cuispes for comfortable accommodations and great food. They can arrange a local guide to open the gate and hike with you to the waterfalls. Pro Tip: Support the local communities! Often the Peruvian government doesn’t support private reserves, hence the natural wonders of Peru are disappearing quicker than they can be saved. It took the community of Cuispes ten years to set up and build the trails leading to the waterfalls and the gates protecting the private entrance. When I went my guide was a local grandmother who also tended her llamas on the walk from town to the gates of the reserve. She was about my age and still walked my behind off. 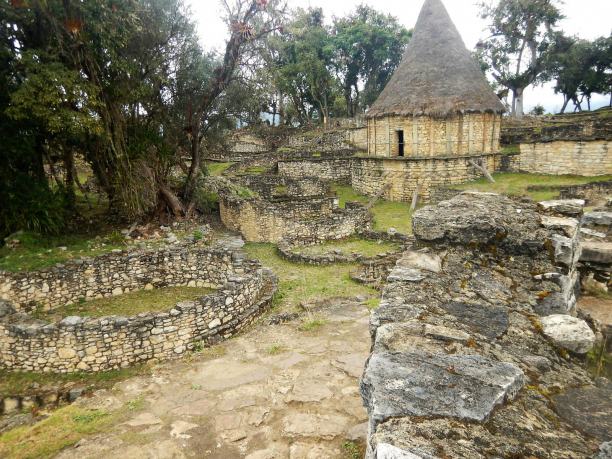 From Cuispes, take a tuk-tuk back to Pedro Ruiz and find a taxi headed toward Chachapoyas. Tell your driver you want to stop in Cocachimba. 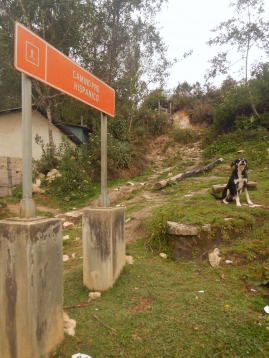 He will likely say, “ah, por Gocta.” Once in Cocachimba purchase a pass to hike to another fabled waterfall. 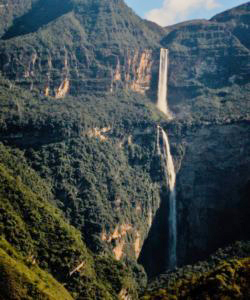 Gocta Falls was unknown to the world until 2005. Farmers living in the remote village of Cocachimba knew that the cloud forest hid the huge waterfall, but local legend involving an adulterous man, a jealous wife and a mythical blonde prevented villagers from visiting or talking about the falls, believing that anyone foolhardy enough to hike to Gocta was chancing a run-in with mortality. This local legend was passed around for generations. Pro Tip: It’s best to plan an entire day to get to the tiny village of Cocachimba and then to hike the trail to the foot of the falls. Don’t worry, there are several places to stay in town. I always stay at the family owned and operated hospedaje # 950091419, close to the plaza and right off the trail. They have rooms for as low as $6 or for a little more you can have a room with private bath and views of the falls. Another option is to treat yourself to a first rate hotel, with exceptional rooms, a restaurant, and an infinity pool with a spectacular view of Gocta Falls. If that sounds appealing, check out the Gocta Andes Lodge. Spend another day exploring Kuelap, one of the largest stone ruins in the world. This world heritage site is 3,000 feet higher than Chacha in the humid, mountain cloud forest of the Amazonian Andes and overlooks the Utcubamba River valley. Protective rock walls reaching 66 feet high surround Kuelap. Some of the walls are decorated with tiled zigzag patterns which are hallmarks of Chachapoya architecture. If you look carefully you’ll see murals and stone carvings depicting felines, snakes and birds, all different gods to the Chachapoya. Inside the compound, there are over 400 round buildings, which in ancient times would have been covered with steep, conical thatched roofs. There are even bones still inside some of the tombs! Getting to Kuelap is an adventure in itself. It’s about 45 minutes from Chacha to Tingo, which sits at the base of the mountains in the Utcubamba Valley. The route to Kuelap from Tingo is via a narrow road with a series of switchbacks up to Nuevo Tingo. The road then snakes its way along one mountain and crosses over to the next mountain, all the while climbing steadily upwards. It’s a spectacular drive! Once you reach the parking lot, there’s a well-maintained path with railings and the occasional bench to one end of the ruins. It’s a moderate half-mile walk (uphill) to the ruins. Pro Tip: Go now! Kuelap, for the time being, is one of the least visited of Peru’s archaeological sites. This could all change. During my last visit, a cable car was under construction to connect Nuevo Tingo to Kuelap. I can only assume the project is complete and making Kuelap much more accessible. The cable car ride will provide a stunning vista of the area and bypass the 90-minute long drive to the ruin site. If being suspended in a cable car isn’t your thing, Jose at Chachapoyas Backpackers can take you to Kuelap in a comfortable van. This year there’s the opportunity for travelers to join a Floating Film Festival, which will be screening Confluir in riverside villages as they raft or kayak the Rio Marañón (aka Grand Canyon of the Amazon). This film follows the month-long rafting expedition of an international team of scientists and river experts as they investigated the natural, recreational and cultural resources that will be impacted by the proposed dams on the Marañón. Local people have protected this river for years and gave their blessing to film in their communities and on their river to tell this story. Marañón Waterkeeper is giving back by premiering the film in the villages along the river so they can be some of the first people to watch it. They hope to show the Spanish version of Confluir in as many riverside villages as possible throughout 2018. Marañón Waterkeeper is seeking support from the international boating community to make these screenings possible. 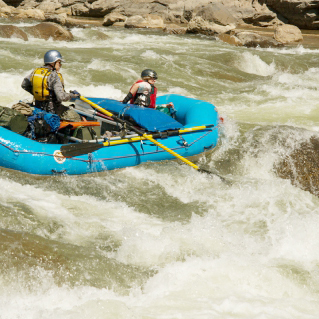 There will be several commercial rafting trips departing May-November 2018 which are open for individuals or groups to join. Each of these trips will stop in a village on their journey down the river. Armed with a projector, generator, screen and sound equipment, Confluir will be brought to the village for everyone to see. 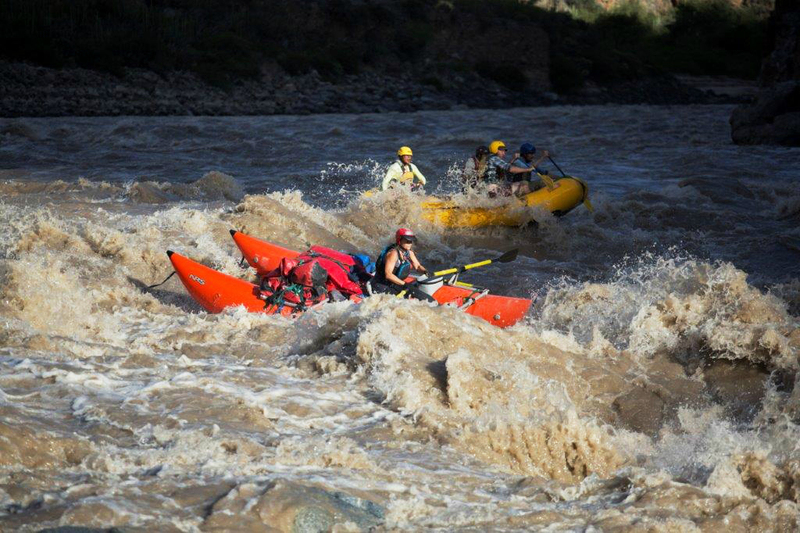 Participants of the “floating film festival” will be able to enjoy a truly unique journey down the Rio Marañón. Pro Tip: Organize your connecting flights within Peru to arrive and depart directly from the take-out and put-in cities. This way, a seven-day section of the river can easily be completed during a single week of vacation, or go for the 14 or 30-day options if you have more time available! For more information visit the Marañón Waterkeeper’s website or email: contact@maranonexperience.com. Lacey Anderson says she is a river gypsy at heart. 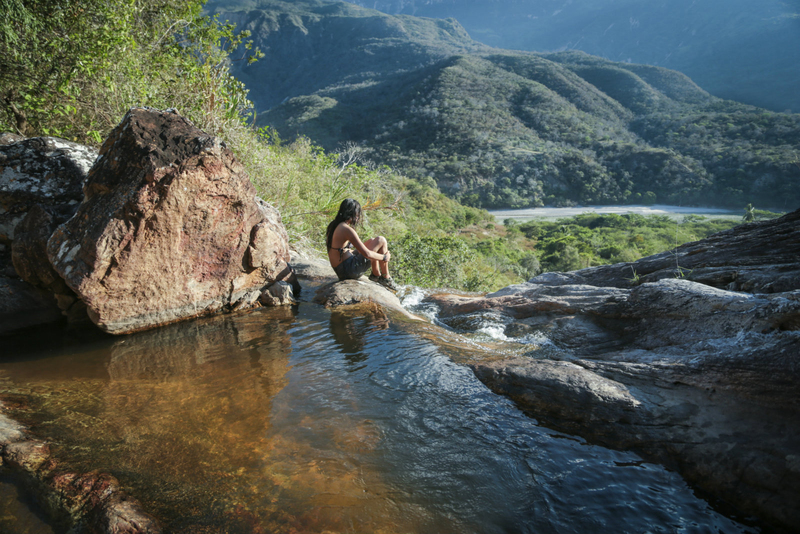 An outdoor recreation guide, she as logged over 12,000 river miles within the US, Mexico, Guatemala, and Peru. She also is an author of two camp cookbooks and contributing writer to NRS’ Duct Tape Diaries. You can follow Anderson on her blog at www.nocoolers.com. Outside Adventure to the Max is always looking for guest bloggers. Contact us at Nickayak@gmail.com, if you are interested.